A GROUP OF left-wing independent TDs are holding a day-long seminar in Dublin later today, but the prospect of it leading to the formation of a new political party in the near future has become more remote in recent months. The Independents’ Network will meet at the Red Cow Hotel in west Dublin today with sessions to focus on housing and debt. Among those to address the audience will be mortgage campaigner David Hall and Ballyhea Says No campaigner Diarmuid O’Flynn. The Independents’ Network, a loose alliance of non-party candidates, saw nineteen of its 36 members – two MEPs and seventeen councillors – elected at the last local and European elections. 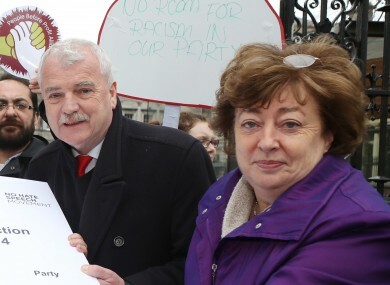 The grouping includes independent TDs Catherine Murphy, Thomas Pringle, John Halligan, and Finian McGrath and aims to bring together interest groups and politicians “with a view to opening policy formation up to a wider, more informed, audience”. Its success in May’s elections fuelled talk of a new party being in the offing but comments by Halligan over the summer are said to have angered other members of the group. In July, Halligan was quoted in a Sunday newspaper report suggesting that the group of deputies would seek to form a party later this year with the name ‘Left Alliance’ given to the prospective party. He later distanced himself from the remarks and insisted “there’s not a party being formed and everyone knows that”. But a source said that the Waterford TD’s “solo run” had caused a lot of issues and delayed any prospect of a new party being formed. While there is still a chance of a new political party being formed out of the Independents’ Network it is not likely to happen in the coming months, TheJournal.ie has learned. The issue of whether or not to form a party is expected to be discussed on the fringes of today’s meeting. One member who won’t be attending is independent TD Maureen O’Sullivan who is believed to have distanced herself from the network in recent months. Former TD Patrick Nulty had also been involved with the group prior to his resignation from the Dáil in March after he sent explicit messages to a 17-year-old girl. Email “Left-wing independent TDs meet today, but here's why a new party isn't happening soon ”. Feedback on “Left-wing independent TDs meet today, but here's why a new party isn't happening soon ”.